My kitchen has made major improvements. It isn't a dream kitchen yet but being able to actually use it feels like a dream. 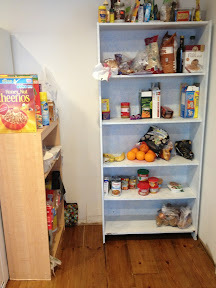 I went out Monday with a goal to hit some second hand stores to find storage pieces to make my kitchen more organized and functional. I stopped at my in-laws to get our microwave cart that was in their shed. I told my mom-in-law my plans and she suggested I look at her house first. Sure enough- we found some nice shelves to help us out. And what's even better is we got them for free! When we actually get cabinets we will return them. And then my dad-in-law came over to help with hooking up the sink and dishwasher. I had all the parts but was nervous doing it on my own. The drain was a little tricky for me to figure out. 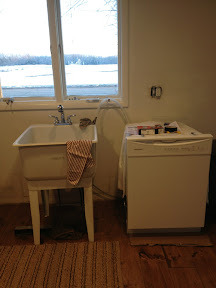 A working sink in the kitchen is so awesome! I have already used the dishwasher! Now where do I put all the dishes? Well, I got a cheap smaller microwave at Walmart which meant I could get rid of the monstrous beast that was sitting on the table. Now I have some sort of counter space to work and store things. 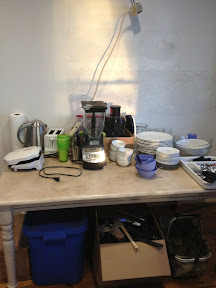 This is how my lovely kitchen is coming along.